Campion Insurance has been named as one of Ireland’s Best Managed companies in the Deloitte Best Managed Companies Awards programme. The company, which demonstrated superior business performance for the eighth year running, was recognised at an awards gala dinner in Dublin on 15 March 2018. The Deloitte Best Managed Companies Awards programme is celebrating ten years of recognising management excellence. 22 new companies join a requalifying network of more than 100 companies, built over a decade of the programme. The awards, in association with Bank of Ireland, culminated with the Best Managed Companies Awards symposium and gala, which was attended by over 1,000 people from the Irish business community. In total 137 companies were recognised as Best Managed Companies and have a combined turnover of over €12 billion. 26 of the 32 counties across the island of Ireland were represented by winning companies. Commenting on the award, Jim Campion, CEO, Campion Insurance said: “We’re delighted to have retained the platinum standard award this year, our success is down to the hard work, dedication and professionalism of our staff in our 11 offices throughout the country and to the loyalty of our customers across our Personal, Commercial and Life & Pensions divisions. 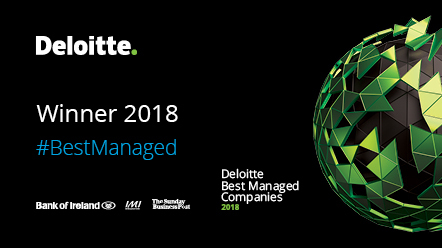 We’re thrilled to be able to continue providing a superior service to all of our clients.” Commenting, Deloitte Partner, Anya Cummins said: “2018 marks the 10th year of the Deloitte Best Managed Companies Awards programme, which has grown from 25 companies in year 1 to 137 in year 10. The programme represents companies from different industries with many industry-specific challenges but also common characteristics such as adaptability, innovation and ambition. Their stories are the stories of Irish business this past decade, and they are stories of resilience, recovery and confidence.” Andrew Graham, Director, Bank of Ireland Corporate Banking said: “The Best Managed programme puts the spotlight on well managed companies that are generating strong returns, as well as growing their businesses through investment in technology, a customer centric approach and commitment to developing leaders of the future. The process and frameworks used by these businesses continues to serve them well in adapting to and succeeding in the dynamic and ever evolving global markets in which they now compete. We have been really impressed by not only the breadth of businesses but also their ambition, drive and determination. I have no doubt that they will continue to set the benchmark for excellence in the years to come and we wish them continued success.” The Deloitte Best Managed Companies programme, in association with Bank of Ireland, promotes and recognises excellence in Irish/Northern Irish owned and managed companies. It is the only awards scheme on the island of Ireland that considers a business’ performance from every perspective.